ALIEN vs Star Wars vs Disney's The Black Hole. What more could a late '70s kid ask for? The diary in which I re-discovered this was given to me by my dad. It's be an old one from his work. 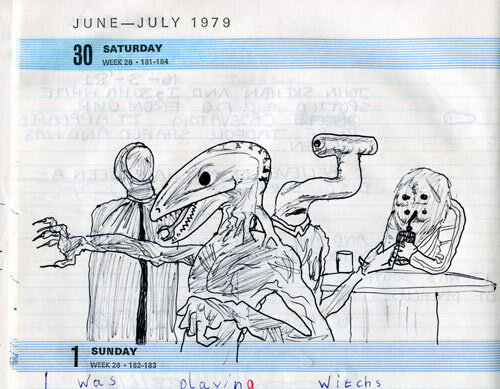 It'd be nice to think that the date exactly indicates when the Xenomorph and the Star Wars cantina Hammerhead character were first brought together but it was probably drawn into an old page. But what really puzzles me is: just why the heck I chose that collection of characters to bring together? It makes no sense at all! Unless - unless - Fox rang me in Kildare to discuss possible future directions for the franchise. To paraphrase Groucho Marx: "Future Movie Franchise Strategy? Why, a 10 year old child could come up with that (whisper) - quick, go find me a 10 year old child..."
My little sister, Candace, also used the diary for drawing and writing, long after I'd finished with it. Probably after I left for art college in Limerick. You can see a bit of her handiwork along the bottom "I was playing Witchs." the other thing I used the diary for was as a sort-of pretend case-file of UFOlogy. John Skehan and I started to watch the night skies and every helicopter-light, or satellite or weird cloud became a special case-study in this book. Lots of CONFIDENTIAL and TOP SECRET stuff pretend-stamped everywhere. I made the serious mistake of relating one of our (dubious) sightings to the class in primary school - or National School as it's called in Ireland - and I was ridiculed! Sometimes it doesn't pay to have an active and excitable imagination when you're a kid. I sometimes ask my teenage nephew how his writing is going (I want encourage him) and he says that he does a bit now and then, but he's careful not to let his 'friends' know about it.